It says a lot about Royce Lewis that he could probably write this profile about himself and it would be more accurate – encompassing all the good and bad – than anything I could hope to draft. Mature, wise, and self-aware beyond his years, Lewis possesses an extremely rare makeup that has many people (including myself) convinced he'll harness his incredible talent and turn into a big-league star. It's only a matter of when. It's tough to weigh things like disposition and character in prospect evaluations, especially from afar. Clearly they matter, but to to what extent? And how can you really quantify such intangible and subjective qualities? It's easier to focus on the concrete and palpable: skills, athleticism, body type. And in each of these areas, Lewis grades out beautifully. But you can't really talk about him as a player without mentioning his striking composure. You can plainly see from watching him talk that the 18-year-old, not a year removed from high school, is unusually sharp and eloquent for his age. He was invited to appear at TwinsFest in January, a rarity for freshly drafted teenagers but a no-brainer in his case. Upon being selected first overall last June, he stashed his $6.7 million signing bonus in a trust fund, opting to live off his modest minor-league wage and foregoing the typical flashy celebratory splurge. Count Lewis's first manager in the system, Ramon Borrego, as a believer. Er, unbeliever. “He’s unbelievable," said the Gulf Coast League skipper. "He knows how to focus. The good thing about him, is he’s very humble. This kid is different." These are good traits in that they project a leader and high-caliber clubhouse presence. But they're also overprescribed and, at times, overblown. It's about what you can do on the field. Fortunately, Lewis's intellect and acumen extend there as well. He's lauded for his baseball IQ, grasping the game's complexities naturally. He recognizes his own weaknesses and limitations in a way you don't often see. "They told me to play at short until I prove I can't," Lewis said last month, candidly adding: "I know I can always transition to center field and play at a high level." Regardless of where he ends up defensively, he figures to be an asset with his top-end speed (he's no Byron Buxton, but he's not that far off) and smooth movements. Lewis's hitting tools are advanced, which was made obvious by his bat's seamless entry into the pro ranks. Lewis posted an .803 OPS in the GCL, with more walks than strikeouts, and impressed the organization so much he was promoted straight to Cedar Rapids in August. He ended up being the third-youngest player to take an AB in the Midwest League. Despite facing opponents nearly three years older on average, Lewis more than held his own, batting .296/.363/.394. He finished 18-for-21 on stolen bases between the two levels. The No. 1 pick is a speedy, selective, disciplined contact hitter, and prospect analysts are unanimous in believing that more power – perhaps much more – is on the way as he fills out. Once that element of his game arrives, Lewis could become the true embodiment of a five-tool player. Adding muscle mass will be a key area of focus in the next couple of seasons. Lewis checked in last year at 6'2" and under 190 lbs. "I feel like I haven't grown into any of my man strength yet," as he puts it. He's already well on his way to bulking up, having reportedly added around 15 pounds in the offseason. It would be no surprise to see a rapid uptick in power, which would place him on a mind-boggling trajectory offensively. The more interesting thing to track right now is his defensive development. The Cali native didn't play shortstop until his senior year of high school, and was – according to ESPN's Keith Law – "well-below-average" at the position as a prep. Lewis showed reasonably well at short in his pro debut, but the jury is out, to say the least. If his efforts in the weight room lead to improved arm strength, that could change this outlook. "I'm patient. I'm still only 18 and don't turn 19 until June." More astute words from the man himself. Patience is warranted. Lewis is the best player on our Top 20 list but also the youngest. He finds himself on the fast track after tackling Low-A within three months of being drafted, but the Twins will probably take it somewhat slow with him, even if he forces the issue on his end. For comparison, Buxton – who hardly could have performed better during his rapid ascent through the minors – didn't reach the majors until three years and eight days after his draft date. That same timeline would put Lewis in a Twins uniform around June of 2020. However, Lewis is already ahead of Buxton's pace, and Buck also lost nearly an entire season in the minors to injury. So, who knows. Right now Lewis has a fair shot at beating the precedent set by Buxton, and possibly even fellow first overall pick Joe Mauer, who first donned a Minnesota uniform at age 20, on the third Opening Day after he was drafted. If Lewis remains on a fast track and moves to center along the way, as many expect, it's going to create an interesting dilemma given Buxton's presence. But that's a dilemma the Twins will be happy to have on their hands. 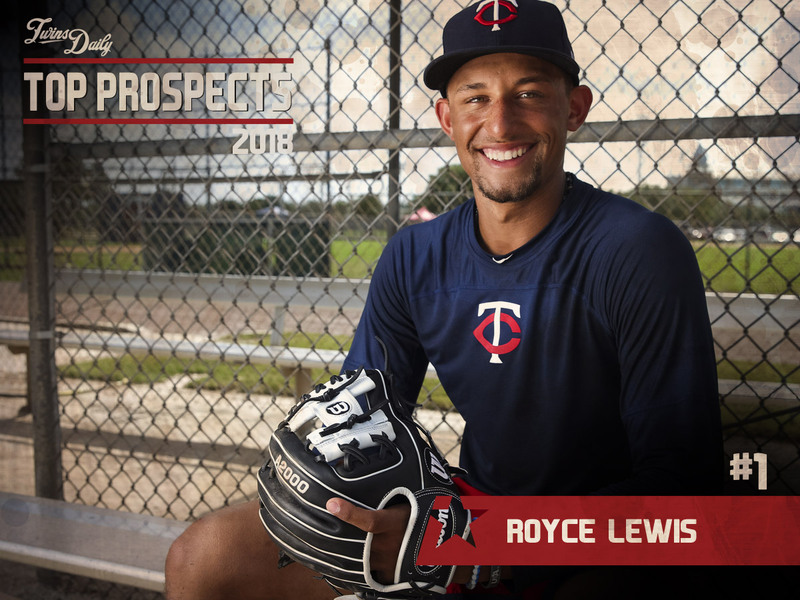 Get to know more about Royce Lewis and much more in the 2018 Minnesota Twins Prospect Handbook. Seth (1), Nick (1), Cody (1), Tom (1). I hope he is half as good a advertised. I hope he's twice as good! If he has a good year, I’m guessing he jumps into the top 10 nationally. If I were in Minnesota I’d get early season Cedar Rapids tickets because the drive yo Fort Myers is a lot longer. Late May/early June anyone? This is one rating that really has me excited.This looks like a star for the future which I hope is not too far away.I would love to see him stick at short - assets like Ripken, Rodriquez...that carry a bat and a glove at short can really make a team.I think the Orioles are figuring that out this year. In addition to the physical talent, it takes a special guy to carry that 1st overall pick load. Glad the Twins found one. Lewis is really the ultimate "Twins" pick. Just a tool shed waiting to be unleashed plus all the intangibles you'd want.. As surprised as I was that we took him over some of those college pitchers, it really isn't surprising that the Twins wanted this kind of guy. Obviously we just have to see him play this year but he does seem to have it and could, like Mauer and Buxton, end up being the #1 ranked prospect in all of baseball. "Upon being selected first overall last June, he stashed his $6.7 million signing bonus in a trust fund, opting to live off his modest minor-league wage and foregoing the typical flashy celebratory splurge." Probably more like 3.7 million after taxes but on the surface of ithe's eithera smart kid or has some smart advisors.Not only is he set for life he can still say "Sorry, I can't pick up this check cuz I don't have access to the money." With Buxton as our CF, Lewis could slide to LF and then nothin but rain drops falling in the OF will really hold true. "Sorry, I can't pick up this check cuz I don't have access to the money." The more I read about this kid, the more this "old school" baseball guy likes him.Assuming good health and natural progression, Falvine seems to have hit a home run on him...and got better value with other picks b/c they took him. One of the things the Cubs did when Epstein took over was to instruct their scouting staff to find not only high caliber players but HIGH CHARACTER players as well when they were drafting. “In the draft room, we will always spend more than half the time talking about the person rather than the player,” Epstein said. “What are their backgrounds, their psyches, their habits, and what makes them tick? I can't help but think about this when considering Royce Lewis. The Twins' decision to select Lewis over the higher profile Hunter Greene may come down to just that. Insiders say the Twins staff preferred Lewis' makeup to Greene's, citing Lewis' lack of social media presence, staying a safe distance out of the limelight, and a solid family life. There is probably more details behind that selection (after all, the Twins went heavier into the analytics side of the draft than they ever did before). This isn't to say Greene lacks character (he is highly involved in charity work already), but there was something about Lewis that separated him from Greene. I have to admit that I was hoping we'd take Hunter Greene and disappointed with our choice of Lewis. We'll know in 5 years if we made the right choice, but I really like everything I've read about the charisma of this kid. I'm sure Falvine spent countless hours researching the pick. If he proves to be the best player in that draft and also allowed Twins to sign the HS pitcher out of Louisiana by signing for under slot money, Falvine will indeed look like geniuses. If they won't take guys on social media, why is Rooker in this system? I love this kid. The early returns are great, and I hope his performance keeps pushing him quickly and steadily up through the system. Cedar Rapids looks like the perfect spot for him to start off this season, and we can let his performance drive when he gets moved up to Ft. Myers. but I would not be shocked if he got a spring training invite in 2020. It'll be fun to see how he tracks against Hunter Greene and Brendan McKay, since it seemed like those were the three players the Twins had been focused around (maybe Kyle Wright too?). It sort of reminds you of the 2001 draft, right? You had people back then pushing hard to take Mark Prior, the more polished pitcher who was MLB-ready or even Mark Texiera over Joe Mauer. Twins made the right then, and I hope they made the right choice this time too. Right now, nothing to suggest they made a bad call.
? Isn't every prospect on social media? The reality is, everyone is on social media platforms. My understanding is that they liked that Lewis stayed away from it. In any event....he could be a great player. I hope so. Since they don't have enough pitching, they need to hit and play defense better and better. In addition to the other replies, I'd like to point out this simply wasn't said. Something can be a factor, without it being a red flag. Hard to believe, in high school, as the team's best player he wasn't placed at SS until his senior year. Just have a hell of another kid playing there previously. The athleticism and work ethic seem to be there. Sure hope they give him time to really learn the position and not rush him just because of his bat. Seems that most ML infielders continue to sharpen and home their skills once they reach The Show. He could end up being more of a work in process when he arrives. McKenzie Gore, Hunter Greene, Brendan McKay, and Kyle Wright aren't going to help any team in 2018. I'm not sure that your point here has any real relevance. It was either a high-quality decision or it was not, and the early indicators are fabulous. I think part of the question mark relates to the fact that he played SS for the first time as a HS senior as mentioned, so prospect gurus had limited information and his defensive skills were in catch-up mode. I vaguely recall one report saying his improvement in the field was impressive in and of itself during the course of the season. Actually, I'm kind of excited by the idea of an outfield of Lewis, Buxton, and Badoo. Wander Javier at SS. All future HoF's of course, no doubts about that.